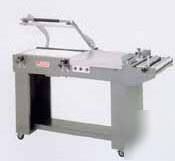 Model PP1622 MK Semi-automatic L' Sealer. Rugged heavy-duty frame. Easy load film cradle with brake. Magnetic hold down. Power discharge conveyor. Smooth seal head return with cylinder. Teflon coated ceramic heads. Pin perf. hole punch. Power belted discharge conveyor. Dual magnet clamping. Locking casters. Stainless steel compensator assembly.